Daily Illuminator: Get Munchkin Zombies 4 Early! January 29, 2014: Get Munchkin Zombies 4 Early! 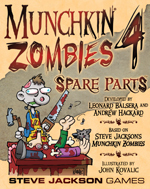 You probably noticed that Munchkin Zombies 4 -- Spare Parts is coming out in March. Want it early? Of course you do! Well, there's a way to make that happen. Your FLGS may have already ordered the Munchkin Zombies 4 Launch Kit. That's four copies of Spare Parts and two +6 Bags o' Munchkin Zombies, plus a couple of promo cards. If you're not sure if your FLGS ordered the Launch Kit, ask them. If they say "no", ask them why not?